Product prices and availability are accurate as of 2019-04-24 10:18:02 UTC and are subject to change. Any price and availability information displayed on http://www.amazon.com/ at the time of purchase will apply to the purchase of this product. The Tactical and Survivalist shop is happy to stock the brilliant Genuine Gurkha Full Tang Kukri Knife - 11" Blade Iraqi Operation Khukuri or Khukris - Handmade By Ex Gurkha Khukuri House in Nepal today at this low price. With so many competing tactical, combat and survival products on offer these days, it is great to have a make that you can trust. The Genuine Gurkha Full Tang Kukri Knife - 11" Blade Iraqi Operation Khukuri or Khukris - Handmade By Ex Gurkha Khukuri House in Nepal is certainly all that and will be a perfect buy for your combat equipment or tactical training. We pride ourselves to provide the best quality tactical gear for all your individual requirements. 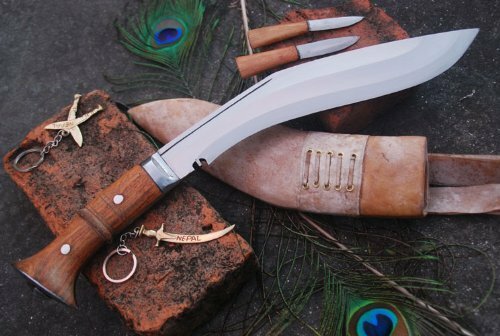 For this great price, the Genuine Gurkha Full Tang Kukri Knife - 11" Blade Iraqi Operation Khukuri or Khukris - Handmade By Ex Gurkha Khukuri House in Nepal comes widely respected and is a popular choice amongst lots of like minded people. Ex Gurkha Khukuri House have produced some nice touches and this results in better value. This Iraqi Operation Freedom khukuri (kukri) is most real and popular khukuri due to the fact that the Gurkha soldiers who remained in Iraq, they can carry this blade. 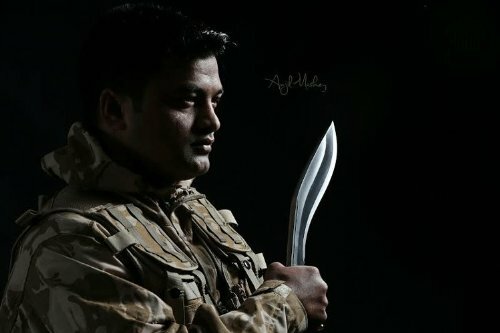 This khukuri (kukri) is new (Current) product of Ex-Gurkha Khukuri House problem to british gurkha for Iraq.This kukri not necessary to all british gurkhas who remained in Iraq but who prefer to have a kukri thay can have & carry this kukri. This kukri handle other kukri then different for working really comfortable & sheath likewise matching with Iraq enviormant, so this kukri is really popular like other gurkha kukri. Inspected routinely by an officer, this khukuri (kukri) is usually used during Traning and Duty. All Khukuris have two pockets on the back of the scabbard which hold a blunt steel called "chakmak" for sharpening the blade or for striking stimulate from flint and a little knife referred to as "karda" used for skinning small animals such as bunnies. The notch (kaura or kaudi) in the blade near the hilt of the majority of khukuris works as channel for the blood on the blade to leak out, hence avoiding it from staining the hilt, in addition to a gadget for capturing and reducing the effects of and enemy blade. Specification of 11" Blade Iraqi Operation Khukuri: This is handcrafted kukri therefore please note that each one may have slight variations in measurement Blade Size & Type: 11" OR 27.5 cm, Highly Grade Carbon Steel 5160, Unpolished Blade. Blade Thickness: 10mm at the spinal column(Approx). Manage size: 5" or 12.5 cm, Full tang made of Indian Rosewood. General Length: 16" OR 40cm from idea to pommel (Aprox) Sheath: Cotton Covered in Refine Water Buffalo hide Blade Weight: 34 oz or 850 grams. 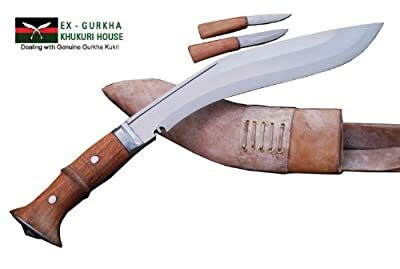 General Weight: 38 oz or 950 grams (Blade, Sheath & two small knives) Shipping Weight: 1.5 Kg Origin: Ex Gurkha Khukuri House factory Angkhola Village in Eastern Nepal. Blade Hardness: spinal column: 22-25 RC, Belly: 45-46 RC, Edge: 58-60 RC, Steel Type: 5160 Car Spring. Dealing in The Genuine Kukri directly from the Home Land Of The Gurkhas Handmade by "Bishwakarmas" (Born khukuri Makers) using the top quality materials in a very traditional way with predictable tools 11" Blade with 5" Rosewood Full Tang handle, Overall length 16" & Thickness about 10mm at Spine Highly Graded Carbon Steel (Steel 5160, Car Spring), Rust Free Blade, Comes with two small Knives (Karda & Chakmak) Authentic Full tang blade, Issue to British Gurkha in Iraq Operation, Hand forge by the blacksmith.